Fruit is low in sodium. A low sodium diet menu includes meals and snacks that bring an individual's sodium intake to 2400 milligrams or less per day, depending on the recommendation of a medical professional. This menu not only focuses on limiting added salts, but also seeks to eliminate foods naturally high in sodium. A low sodium diet menu is necessary for many individuals dealing with various medical conditions, such as high blood pressure, kidney disease, and others. Others looking to improve their health and well being may choose to limit the amount of sodium in their diet, as well. Regardless of the reason, a low sodium diet menu can be a great way to improve your health. The following are some menu ideas to suit your low sodium diet. Start your day off right with a low sodium morning meal. Toast and Eggs - Try two slices of whole grain toast with a small amount of low-fat margarine and one scrambled egg with no added salt. Fruit and Yogurt - Top a bowl of your favorite berries or fruits with some plain low-fat yogurt. For extra protein, try Greek yogurt. Bowl of Oatmeal - A simple and nutritious bowl of oatmeal is a great way to start your day. Use a sugar substitute and low fat milk to add sweetness and flavor. Lunch is often overlooked or rushed due to work or time constraints. Take the time to plan your lunch. It's a healthy way to enjoy your mid-day break. Tuna Salad Sandwich - Make your own tuna salad with low sodium or rinsed tuna, chopped celery and fat-free mayonnaise on two slices of whole grain bread. Serve the sandwich with a piece of fresh fruit and low-fat flavored yogurt. Tossed Salad with Baked Chicken - Mix up a fresh salad with your favorite greens and raw vegetables and top with three ounces of baked chicken breast with no added salts. Use herbs to season the chicken in place of salt. Use a mix of oil and vinegar in place of bottled salad dressings. Peanut Butter and Jelly Sandwich - This quick and easy sandwich isn't just for kids. If you are pressed for time, throw together a peanut butter sandwich, along with a banana and a glass of milk for a delicious and nutritious lunch. Cooking meals at home can save thousands of calories and can drastically reduce the amount of sodium you take in. Here are a few simple meal ideas your whole family will enjoy. Spaghetti with Tomato Sauce - Boil a batch of spaghetti noodles, but create your own tomato sauce. In place of high sodium sauces, create your own with fresh tomatoes, herbs, and salt-free spices. Add unseasoned meats, beans, or tofu for protein. Steamed Tilapia with Brown Rice and Broccoli - Boil a pot of brown rice, seasoning with garlic powder, onion powder, or herbs like dill or rosemary. Steam both fish and broccoli using any salt-free seasoning you prefer. This meal will feel decadent enough to feed your family without any added sodium. Steak and Potatoes - If you're looking for a hearty meal, consider this old standby. In place of meat tenderizer, use spices, rubbing seasonings into meat before grilling or baking. Bake potatoes and use Greek yogurt in place of butter, sour cream, or salty toppings. The following are a few low sodium snack ideas. Fresh Fruits - Use yogurt for dipping. Raw Vegetables - Greek yogurt mixed with fresh dill makes an excellent and quick-to-make dip. 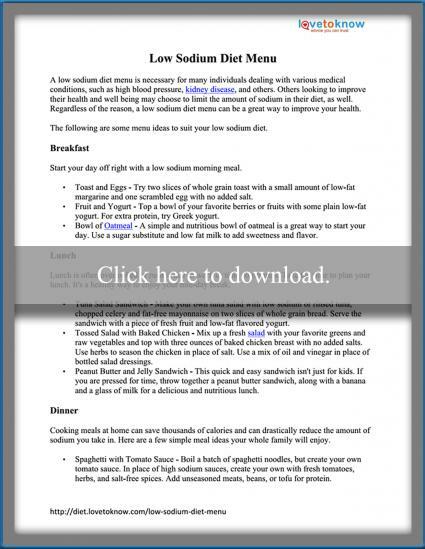 This type of menu is usually available from your doctor or through a registered dietician. Other places to look are on the websites of local hospitals, which may publish recommend low sodium diets in order to encourage patients and local residents to improve nutrition-related health conditions. Likewise, the Internet in general is a good place to look. If you are following this type of diet as a result of a medical diagnosis, remember the best diet information will be tailored to your own medical needs.